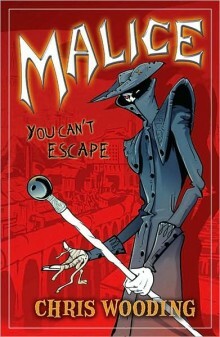 Everyone’s heard of Malice, but hardly anyone has actually seen it: a comic about a horrifying world of tricks and traps, overseen by the sinister master of ceremonies, Tall Jake. The story goes that the kids who go through Tall Jake’s deadly trials are real kids, who’ve disappeared from the real world and turned up in the comic. But it’s just an urban legend, right? Malice was an idea I’d had brewing for a long time: a combination of book and graphic novel, where sections of text give way to sections of comic art and back again. The challenge was to make it more than a gimmick, so that the comic sections were an integral part of the story. I got round that by making it a book about a comic, and the rest fell into place. In Malice, the comic sections represent parts of the published comic, and so anyone in the real world – good guys and bad guys – can read them and pick up information about what’s going on with the kids trapped inside Tall Jake’s world. Malice was the first fantasy I ever wrote that starts in the real world, as opposed to starting in a fantastical one and staying there. I was very keen that this book would be pinned to reality as well as fantasy, to keep it grounded. So I came up with parallel stories, one playing out in the real world and one inside the wild world of Malice. It turned out to be a lot of fun to write that way. I was also writing it a little younger than my previous YA books, taming the language and keeping sentences simple, because I’d begun to feel that the elaborate writing of Poison, Haunting etc was alienating younger readers and it was better suited to my adult books. I hope it has the desired effect: to speed up the narrative and allow the reader to ‘see through’ the words and into the story. But that’s a matter of personal preference, I guess. Malice is the first of a duology, concluding with Havoc in 2010.